There is something exquisitely compelling about the American musical, Avenue Q, for it seems to tap into so many pockets of one’s psyche I dared not take my eyes off the stage. Ten years ago, this hilarious concoction of Jeff Marx Robert Lopez, was sweeping the board at the Tony awards,winning best musical, book & score. The audience are offered a curious version of the iconic children’s show, Sesame Street, where the puppets swear & shag with gay abandon. Indeed, one of the puppet sub-plots is about Rod, a wall-street banker trying to come out of the closet. 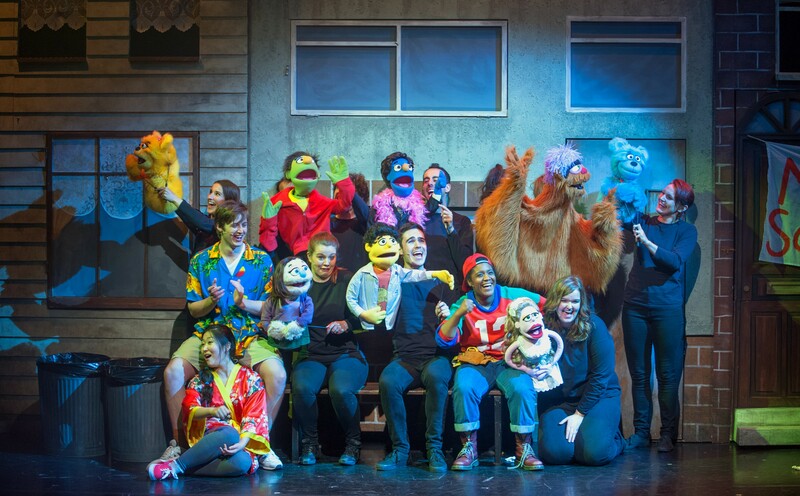 Avenue Q is basically the street of a run-down New York neighbourhood in which a quirky bunch of misfits ply the trades of their lives. On paper, the cast of seven, from Sell a Door Theatre, had their work cut bringing the characters to life – especially for a British audience – but they have done a sterling job. The delivery of the songs & snappy one -liners is a fast-paced, flowing treat. There is a beautiful synchronicity between the facial expressions of puppeteers & their puppets, which blend into a symbiotic creation – a sort of theatrical double-vision- that really enhances the experience of watching Avenue Q.